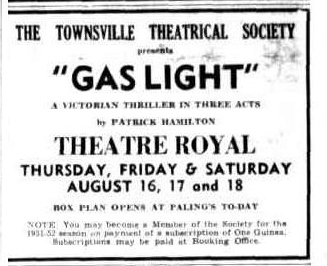 “Gaslight” was performed on Thursday 16, Friday 17, and Saturday 18 Aug 1951 at the Theatre Royal. V. Johnston, W. Newman, F. Feather, J. Phillips, G. Saunders. Under the direction of Eric Rees the five person cast gave one of the society's most competent performances. The play's atmosphere of haunting suspense was captured from the first curtain by the shadowy mustiness of the overfurnished set, by the long moment of silence, but most of all by the pathetic tautness of Isabel Fitzpatrlck, as Bells Manningham. Her gestures, movements and voice were those of a woman terribly unsure of herself. Her alternate doubts and trust had complete realism. A most theatrically effective drama. 'Gaslight' is a study in insanity—real and imagined—revolving around a brutal but almost forgotten murder. As Manningham, Dan Fitzpatrlck was suavely menacing and domineering in his clever study of a psycopathic case. Youthful James Thompson, as the detective, had probably the most difficult job. He sustained the character of Rough, however, by shrewdly pedantic gestures and speech. His movements, and gait were deliberate and entirely convincing. Like Mrs. Fitzpatrick he has a most persuasive and pleasant voice. Norma Sundstrup made the wantonly attractive maid Nancy an interesting person. Her brazen flirtation with Manning hem help build to the climax. As the faithful Elizabeth, Mollie Walsh was steadfastly in character. Select ‘stars' of the evening were the striking lighting effects —the gaslight of the play— and the atmospheric incidental music cleverly synchronised to the movement of the drama. 'Gaslight' is to be presented again to-night and on Saturday.